I cannot tell you how many times in my thirty-six years of government service I have heard that speech. Every time our political leaders address civil servants, they play the same broken record. Yet, when elections come around, the same political leaders praise the civil servants and give them bigger bonuses. And all the while, the public keeps on complaining that they are not getting the service they are entitled to. Many observers in fact feel that our civil service has gone from good to bad despite all the training programs, study tours, and MAs and PhDs that now fill the upper echelons of the civil service. Certainly, that is my observation from my 36- year vantage point in the service. Our civil service is wonderfully adept at coming up with new programs, campaigns and slogans that at the end of the day hinder rather that help. If all the circulars and directives were to be compiled into a single book, it would be too bulky to carry. Most are forgotten within a few months anyway. 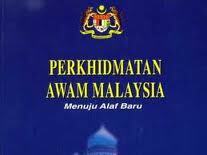 JPA should create a new post – ‘Director-General for Circulars – if it hopes to see them implemented. JPA, and INTAN in particular, seem more obsessed with regurgitating the latest business philosophies and ideas from Harvard or Kellogg business schools or some new book and see that as progress and performance. One year it is bench-marking, another year it is paradigm shift. Many a time, business models that have no business in public service are mass marketed across the service. Concepts that are hardly digested by the lecturers themselves are imposed upon ill-prepared civil servants who nevertheless mouth the new jargon to impress their bosses. There can be little doubt that most of these initiatives are completely worthless in so far as enhancing performance and improving delivery are concerned. If our political leaders see the need to keep pressing the civil service to change, to be more pro-active, more dynamic, etc., year after year, they must either know that things are bad or they must be merely going through the motions, making speeches for the sake of making speeches. If it is as bad as they seem to think, they should fix it once and for all instead of going on and on about it year after year. And while I’m on this subject, I have to say that I have not seen even one really visionary speech given by our political leaders to the civil service. With that kind of mediocre political leadership, it is no wonder that the civil service, and much else in Malaysia today, is adrift, without direction, purpose or focus.